Editor’s note: Few to none have done a better job of defining the “sense of place” in California. “Former California State Librarian Kevin Starr, who produced rich social, cultural and political histories that chronicled the origins and rapid transformation of the Golden State, has died,” the Los Angeles Times is reporting. “He was 76. “Starr, a professor at USC, died of a heart attack Saturday at a hospital in San Francisco, according to his wife of 53 years, Sheila Starr. “Starr captured the state’s rise in influence, and its singular hold on the public imagination, in ‘Americans and the California Dream,’ a sweeping series of books that start with the Gold Rush and go on to focus on the Progressive Era, the 1920s, the Great Depression and other distinct chapters of California’s past. “Throughout his work, Starr celebrated the state’s creativity, its innovation and openness to ideas. And he demonstrated a familiarity with a vast range of topics central to the state’s development and its image of itself: architecture, agriculture, literature, water infrastructure and the entertainment industry, among others. “’He was the greatest historian Los Angeles and California ever had and ever will have,’ said former Los Angeles Mayor Richard Riordan, who hosts a book club that counted Starr as one of its original members. I recall a lunch at Miners Foundry several years ago, organized by Terry McAteer, (who was then county superintendent of schools), with Kevin Starr as the featured speaker. Probably 80-90 people in attendance, and Terry gave me the high honor of being part of the program. Kevin’s topic that day was the life of Grass Valley-born Josiah Royce –– a person he wrote about quite a bit. My assignment was to prepare the audience for Kevin’s presentation by describing Grass Valley and Nevada City in 1855 as Royce was coming into this world on Mill Street. A few years ago, a reporter asked Kevin, “If we had our own currency in California, whose faces should be on it?” Dr. Starr provided three names –– and the first person he mentioned was Josiah Royce. I am saddened to hear of his death. As someone approaching his 75th birthday, I happen to think 76 is far, far too soon for anyone to die. 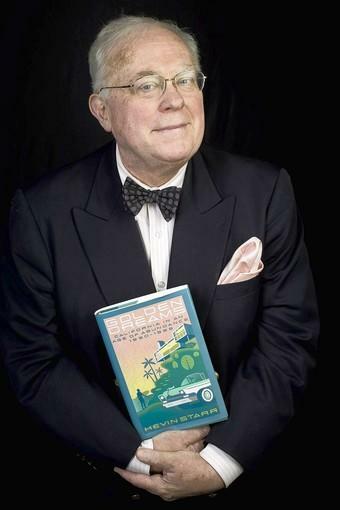 Kevin Starr’s death is a huge loss to the historical community, but his books, magazine articles and other published works will continue to serve as important resources for those with an interest in California history. We were proud and happy to have Kevin Starr deliver a keynote speech at a Sierra Business Council conference in Yosemite several years ago. Kevin Starr was a huge influence on my thinking about the state of California, California’s culture, the California dream, and what our place as citizens is in building a better place. I am saddened by his death–he truly was an inspired and brilliant writer–but I am comforted by the fact that he becomes a part of the very rich tapestry of California that he colorfully described.